Ever walked past the space 7-11 used to occupy and wondered what would be coming next? Well, most of you would have noticed the telltale sign board “Chill@RI”. Chill@RI will be opening its new outlet on May 2 2014. Rapid renovation works and store cleaning are currently occurring at the space which used to house 7-11, to prepare for the new Chill@RI outlet. This new shop not only shares the same name as the minimart over at the Hong Leong Swimming Pool/RI boarding complex, but is also managed by the same couple, Aaron and Joanna. Aaron and Joanna have had plenty of experience serving RI (Year 1-4) students at the minimart but with the new shop at the heart of the Year 5-6 campus, they hope that they can reach out to the Year 5-6 students more. Interestingly, Aaron and Joanna also run a convenience store and a cafe at Hwa Chong Institution! The sudden disappearance of 7-11 caused quite some buzz among students. When we interviewed Mr. Kevin Wong from Estate house, he shared with us 3 main reasons why 7-11 chose not to renew their lease. One was that their contract with the school ended last December. Coupled with “poor business” and a lack of manpower, the franchise finally decided to leave the school. Prior to 7-11’s departure, a SUBWAY outlet also withdrew from RI in 2012 due to similar reasons, leading to the school calling for an open tender – we even published an advertisement in the newspapers. Eventually, the panel selected Aaron and Joanna and granted them the license to open a store here. Now, on to the much anticipated food items to be served in Chill@RI. Most of the foodstuff will be similar in price as well as range as the ones sold at RIB. There will be waffles and pastries to cater to those with a sweet tooth, ‘Healthier Choice’ products for the more health-conscious, and even shampoo and other toiletries for the boarders. The store will also stock items from the popular bakery Delifrance, such as cakes, donuts and muffins, all at a discounted price! 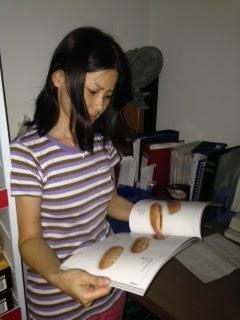 Aunty Joanna flipping through Delifrance pastry menu. However, due to limited space and restrictions imposed by food licenses, the new minimart will not be able to serve made-on-the-spot waffles that have been a hit at Chill@RIB. Nevertheless, pre-made waffles and pastries will be served, along with other trademark minimart food items. Quite a number of students are looking forward to the new store. “Finally I don’t have to walk all the way to the RI boarding side!” remarked Mahina Azeem of 14S03R. Indeed, opening the store at the Year 5-6 side has made the shop more accessible for Year 5-6 students who frequent the minimart. Since the shop only closes around 7pm on weekdays some students have also mentioned that they can get themselves something to eat in the evening after the canteen closes. The number of days to the opening of the store is not far away. As remedial lessons, competition periods and late night trainings ramp up, this convenience would surely come in useful. 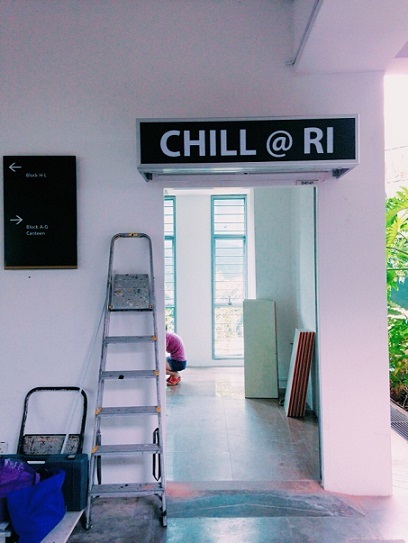 So start looking forward to Chill@RI Year 5-6 branch!